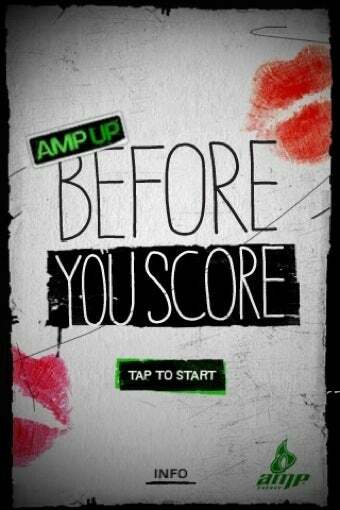 In order to promote their AMP energy drink, Pepsi recently released an iPhone application called "AMP Up Before You Score," a program that helps men work on their "game" by providing tips on "scoring" with women. Charming! The application works by breaking women down in to 24 set types. Once a man identifies the "type" of woman he's after, it provides him with tips on getting her to sleep with him, giving helpful hints like directions to hotel rooms and links to facts that might impress a certain "type," as well as a means for the man to brag about his conquests on Facebook or Twitter. High class, sassafrass! Don't you wish your date was gross like me? Don't you wish your date was a creep like me? Don't cha?! Get lucky? Add her to your Brag List. You can include a name, date and whatever details you remember. You got it? Flaunt it. Keep your buddies in the loop on email, Facebook or Twitter. Ah, yes. Can't leave out the twins or the women's studies major who really just wants to be swept away by your iPhone seduction skills, bro. It's going to be so easy to score with AMP energy drink on your breath and a list of incredibly generic "types" in your pocket. All you need is a fresh Ed Hardy shirt and a spritz of Axe body spray and you are good to go! Jon Gosselin will even pick you up so you can spend the night spending his children's education fund on cubic zirconia earrings together, bro! Everything's comin' up douchebag! There's a reason why I go after bro culture as often as I do: things like this, which are completely unacceptable and ridiculously offensive. This is a program sponsored by a major corporation that encourages men to look at women as objects to be won, used, and tossed away after a "victory" is obtained, and the more normalized things like this become, the worse off we're all going to be. If the rationale is that the target audience for AMP energy drink is filled with pathetic douchebags, then perhaps instead of continuing to feed this audience and encourage this kind of behavior, we should offer them something different and stop shoving bro culture down everyone's throats as if it's totally acceptable to Tucker Max-it out at all times. Until then, the best we can do is to mock it mercilessly; if people actually think this kind of thing is attractive and effective, they'll continue doing it, but if it's ripped apart as often as possible, the "awesomeness" factor of stupid crap like this might be dulled a bit. I have said it before, and I will say it again: I am just really tired of bros, man. It would be nice to turn on the television one day and not see some dude completely dehumanizing women as a part of some asinine "game" in order to promote deodorant or soda pop or body wash, but I guess there isn't an app for that yet.